Beijing, China, May 10, 2016 /ChinaNewswire.com/ - Mr. Christopher Chia has been appointed vice president at Shangri-La International Hotel Management Limited and general manager of China World Hotel, Beijing. He will be responsible for the whole operations and services of three hotels, including China World Hotel, Beijing; China World Summit Wing, Beijing; and Traders Hotel, Beijing. Mr. Chia has more than 30 years of management experience. 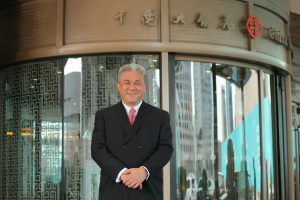 Prior to joining China World Hotel, Beijing, he was the vice president and general manager of Shangri-La Hotel, Beijing. He started his hospitality career with the group as front office executive at Shangri-La Hotel, Kuala Lumpur. He has since held management positions within the group in Malaysia, the Philippines, Singapore, Hong Kong and Beijing. China World Hotel, Beijing soars over the China World Trade Center complex, including the China World Exhibition Center and shopping mall, in the heart of the city’s diplomatic and business district. Hailed one of the first three hotels in mainland China to be awarded a Platinum Five Star rating by the China National Tourism Administration (CNTA), China World Hotel, Beijing has been named one of the world’s best hotels by both Condé Nast Traveller and Travel + Leisure magazines. China World Hotel, Beijing has also been voted “Best Hotel in Beijing” by Euromoney, Frommer’s Guide and Finance Asia; “Best Business Hotel in Beijing” by Business Traveller China and Asia Pacific, TTG Asia, The Asset and Asian Legal Business; received the “Top Ten Business Hotels in China – Golden Pillow Award” by 21st Century Business Herald; and named one of “The Top 50 Hotels in China” by Forbes and Travel + Leisure China. Hong Kong-based Shangri-La Hotels and Resorts currently owns 95 hotels under the Shangri-La brand with a room inventory of over 39,000. Shangri-La hotels are five-star deluxe properties featuring extensive luxury facilities and services. Shangri-La hotels are located in Australia, Canada, mainland China, Fiji, France, Hong Kong, India, Indonesia, Japan, Malaysia, Maldives, Mauritius, Mongolia, Myanmar, Philippines, Singapore, Sultanate of Oman, Taiwan, Thailand, Turkey, the United Arab Emirates and the United Kingdom. The group has a substantial development pipeline with upcoming projects in mainland China, Cambodia, Hong Kong, India, Myanmar, Philippines, Qatar and Sri Lanka. For more information and reservations, please contact a travel professional or access the website at www.shangri-la.com.